A delicate piece that features 0.87ct total weight of Tanzanite and 0.03ct total weight of Diamond. The Tanzanites are a nice rich blue color with vibrant white Diamonds to compliment them. 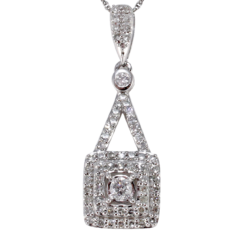 The stone are set in a 14kt white gold chain.